The contest starts on June 06, 2018, at 4:15 pm and ends at 5:00 pm (UTC +7). Everyone who wishes and complies with the contest requirements can take part in the contest. Employees of Nami and their relatives cannot participate in the contest. Contestants must register for the contest. It is prohibited to register multiple accounts, as well as trading with an anonymous proxy server. Registration ends 15 minutes before the contest starts (on June 06, 2018, at 4:00 pm). All requests received after the closing time will be rejected. The participation in the contest is free of charge. Anyone who attends the N3 event and joins the contest will receive 1000 NACs to his/ her wallet. Others who register the contest via contest.nami.trade will receive 100 NACs deposited to their wallets. Each contestant must place at least 10 orders/ accounts. All orders must be closed before the contest ends. The final result of the contest will be determined based on the profit percentage (in NAC) and announced officially right at the end of the contest. Top 3 contestants with the greatest positive profit percentage (>30%) and who will satisfy all the above rules will be proclaimed the winners. All contestants who has > 30% profits at the end of the contest will receive 500 NACs. Step 1: Fill in the application here. Step 2: Connect your wallet to Trust Wallet app. Find the tutorial video for using Trust Wallet app here. Step 3: Take part in the event or watch our livestream and be ready for the contest! Time: 15:00 – 18:00, 06/06/2018. Venue: DreamPlex, 195 Dien Bien Phu, Binh Thanh District, HCM City. Good luck and see you again at the contest! 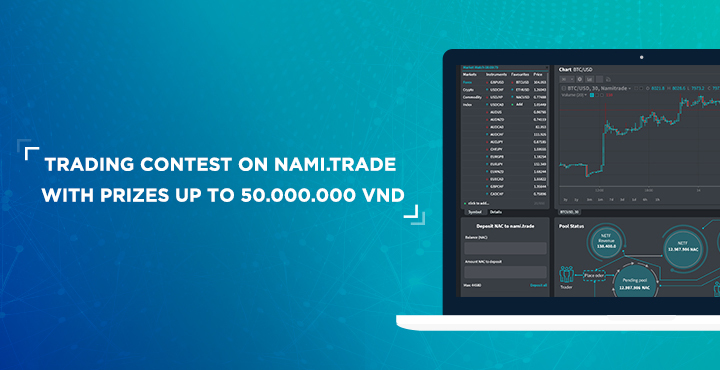 Find out more about the trading contest here!